The controversy surrounding GMA’s ‘Alyas Robin Hood’ spills into TV5. Recently, TV5 poked fun on the comparisons between ‘Arrow’ and its perceived copycat ‘Alyas Robin Hood’. With season 3 of the Tagalized ‘Arrow’ set to air next Monday on the said network, they decided to have a good time by posting the following questions on their Facebook page. The third card on the post above needs no explanation. Still, the desperate need of attention is clear, as TV5 tries to make sense of themselves amid their programming woes. Going back to the controversy surrounding ‘Arrow’ and ‘Alyas Robin Hood’, it seems like many have moved on from this issue. In fact, since its debut, ‘Alyas Robin Hood’ has been faring well in the national ratings, giving the suddenly slumping ABS-CBN drama ‘Magpahanggang Wakas’ a run for its money. That said, TV5’s decision to poke fun on the ‘Alyas Robin Hood’ issue came too little too late. 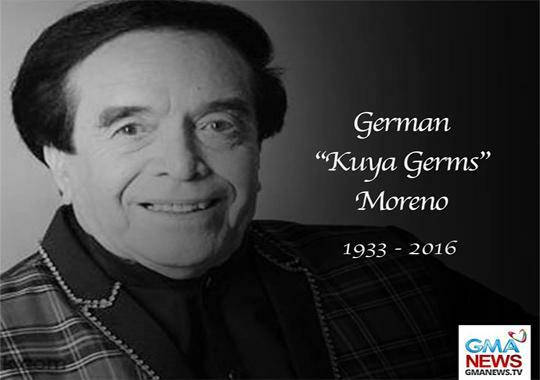 For the Kapatid faithful who still had TV5’s back despite their quality in question, this is very disappointing. As mentioned earlier, ‘Arrow’ season 3 will be aired on TV5 starting next Monday at 7:00 p.m. For those who want to watch the original English dub, there is the current fifth season of ‘Arrow’, which airs every Thursday at 1:00 p.m. on Jack TV, and 8:00 p.m. on 2nd Avenue. 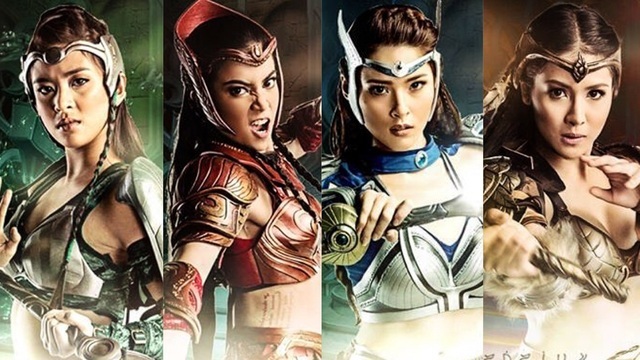 An upcoming GMA fantaserye is in the headlines for both the right and wrong reasons. When a trailer for ‘Alyas Robin Hood’ was released earlier this week, it quickly became a trending topic on social media and on various international news outlets. But instead of praises from netizens, a lot of criticisms were thrown into the mix, most of which were claims of being a ripoff of the American action series ‘Arrow’. In fact, ‘Arrow’ lead actor Stephen Amell even shared the said teaser, which featured a ‘shocked’ emoji. Poor Dingdong Dantes. 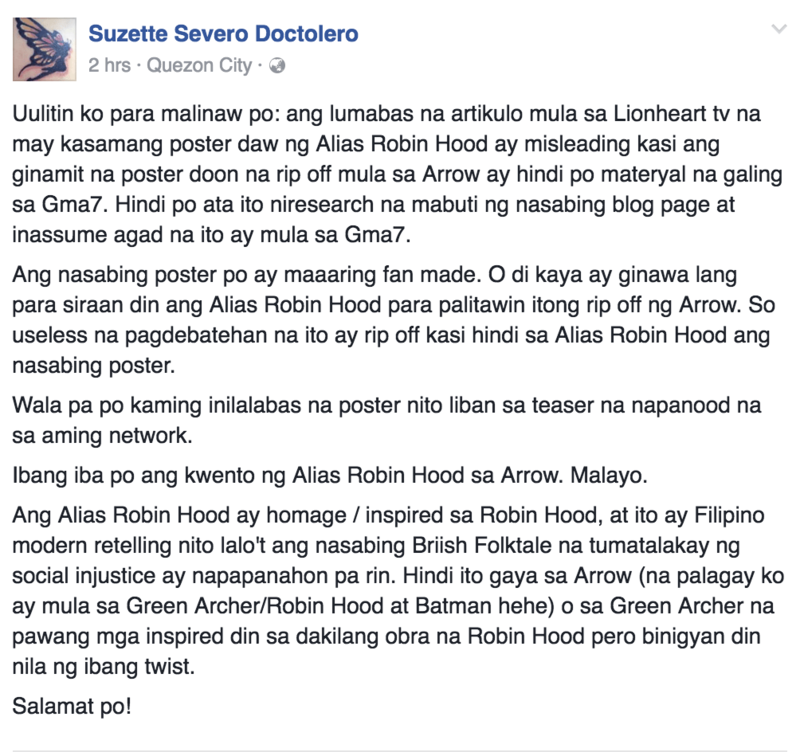 Amid the criticisms surrounding ‘Alyas Robin Hood’, the show’s consultant Suzette Doctolero has this to say regarding its comparisons to ‘Arrow’. LionhearTV then clarified that the poster was fan-made and not an official photo of GMA Network. In fact, some of the images used on the fan art were past photos of GMA artists and not publicity photos for ‘Alyas Robin Hood’. Doctolero further explained that Robin Hood is an inspiration to many similar literary works, adding that every super hero in general was derived from master plots. She then pointed out that no one holds a copyright to Robin Hood (see post below). Finally, GMA Entertainment vice president for drama Redgie Magno issued her own statement on the matter. The teaser for ‘Alyas Robin Hood’ only ran for 15 seconds. In essence, the teaser was a mere hint of what is to come. Let’s face it, it is unfair to compare ‘Alyas Robin Hood’ to ‘Arrow’ considering that the storyline of the series is yet to be revealed. Thus, the negative reaction to the former is not justified. However, it is clear that Philippine television has a lot of flaws. The teleseryes, in particular, continue to use recycled storylines, and most intelligent viewers would be better off watching weekly American series instead. It remains to be seen if ‘Alyas Robin Hood’ will be an epic disaster or an unexpected winner. Right now, though, viewers will have to wait for its premiere and see for themselves.